Some dogs just love to jump into a pool in order to cool down and have some fun. However, regular pools can be too deep without wearing a dog life jacket and cheap inflatables can be damaged easily from the dogs claws or teeth if they bite it. In the hot weather, dogs can really struggle to cool down and a dog pool is an excellent solution for such a scenario. Not all dogs enjoy the water but for those that do, it can provide them with a lot of happiness. It may be tempting to use your kids inflatable pool but of course, this will not be able to withstand your dogs presence. This is primarily due to the kids pool using a cheaper plastic material, which can become pierced via the dogs claws or teeth. Dog pools come in a range of types that include inflatable, folding and rigid pools. Choosing between the three is based on your own personal preference with each having separate pros and cons. Below is a list of the best dog pools that will be durable enough to withstand your dog and allow them to have plenty of fun whilst cooling down. The FrontPet is a foldable dog pool that uses paneled segments to fold up and down easily. This means is fairly compact when completely folded, which is great for storage during the winter. It is by far the most convenient dog pool as its lightweight, folds and required no time consuming inflation. Overall, it is the best dog pool that is easy to store, transport and durable enough to withstand dogs. Although the brand claim that the material is fairly tough, we would recommend that you choose a rigid type of dog pool if your dog is a chewer. For those that own multiple dogs or want to provide their only dog with as much room as possible, then the this dog pool is ideal. It is a huge 63 inch in diameter, which will provide your dog with plenty of room. The Topeakmarter is the best option for those that have multiple dogs that want to play in the pool at the same time. Like the FrontPet, it is a heavy duty PVC material that folds into a compact size and is relatively easy to put together. For larger dogs or those that like to chew, a rigid dog pool is the best option if you want the pool to last. The One Dog, One Bone is one of the best and the brand claims that it is UV and chew resistant. Overall, the One Dog, One Bone is a great all-rounder and perfect for dogs that chew. The rigid construction means that it may be harder to store than the others but it is UV resistant in case you just want to leave it outside. Jasonwell is by far the most popular as it offers five different sizes for each type of breed. 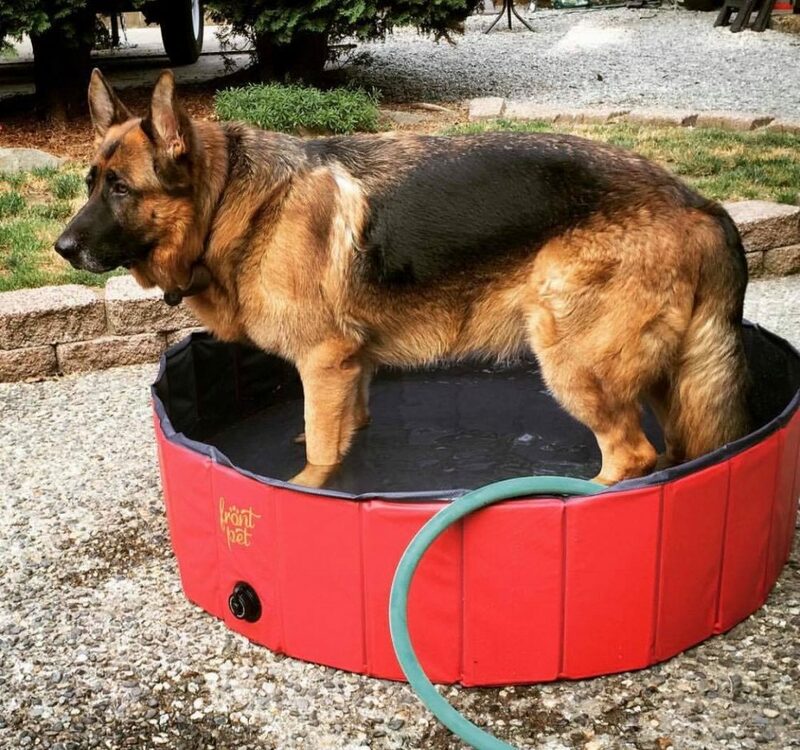 Like the other alternatives, it is a foldable dog pool that uses extra-tough PVC with a thicker slip resistant material on the bottom. Sizes range from 22 x 8 inches to the much larger 63 x 11.8 inches in dimensions. Overall, it is a dog pool that offers excellent value for money and along with an intuitive design, which will not disappoint. The Alcott dog pool is an inflatable made from a thick PVC so that is suited for small to medium dogs. Unlike the foldable alternative, you will need to put some thought into folding the pool and inflated it too but it is a cheaper alternative. The Alcott Mariner is a suitable inflatable dog pool for smaller dog breeds. If you have a large dog, it will probably be best to choice a more rugged and larger alternative. However, for small dogs that do not chew, the Alcott Mariner is a great option and last many years with careful storage. Dog pools are a great way to cool your dog down on a hot day. They are fun and easy to put up to keep your pet happy for hours. Pools are a great way to get exercise for your dog. They will have the freedom to jump in and out as they please and dependant on the size of dog and pool they will be able to swim. This is great practise for the dog as they will be familiar with water and you will know that your dog will be able to cool off and swim in the sea if you were at the beach. In the hot weather, cooling off is a must for a dog and a dog pool will come in handy. They will be able to cool off in the pool and sit in the shade to keep them comfy. In addition to this Dog pools are very sturdy, they are able to cope with your pet jumping in and out and cope with their paws and claws on it. Therefore stating the importance of buying a Dog pool over a normal pool. Dog pools can also be helpful when bathing your dog. Dogs may feel trapped being bathed in a bath or shower and they cannot easily escape, so for dogs who are nervous in the shower or bath a dog pool may be very useful. As with regular swimming pools. there is a wide variety of different designs and constructions to choose from. The same can be said with dog pools, with the choice of either an inflatable, foldable or rigid design to suit your dogs requirements. These can be easy to use, simple to put and put away. However they are could easily punctured by your dogs claws if you were using an example not suitable for dogs. Another drawback is that you will need to inflate it each time you want it to be used. However, it is by far the cheapest type of dog pool available. The foldable dog pool is by far the most popular and this is due to minimal maintenance and the ease of setting it up. They simply fold out and require no inflation. Simply connect the drain plug and then fill the dog pool with water. They also fold down into a compact size, which is great for storage. These pools are usually made out of polyurethane. They are great for the larger dog and this is due to the fact that they cannot be pierced or broken easily due to the materiel. They are tough and can withstand a lot of use such as your dog playing and running in and out. However, they are usually fairly expensive and can be a pain to store inside your house or garage. There are numerous different types of pools with different materials, it is important to look for a material that is suited to your dog. Polyurethane – this material is very durable for dogs with bigger paws. This material would be a good idea for the larger dog who likes to jump around. PVC – This is a great material for those who would like to put the dog pool away at the end of the day. It can be easily folded and thus does not take up much space. Whilst the pool can be fun you must ensure that you clean the pool as hygiene is important. Ensure that the material used can be easily cleaned after use especially if you are going to use the pool as a bath as described above. It is important to remember the size of your dogs legs. Look at your dog and make a decision on the height of your dog. There are tools that can be used to help your dog get in and out of the pool. Pools are fun but if you purchase a pool that is not the right height for your dog this may be scary for them and thus scare them. Depending on the size of your dog will determine the size of the pool to buy. Remember if you want your dog to be able to swim around to go for a bigger pool!. 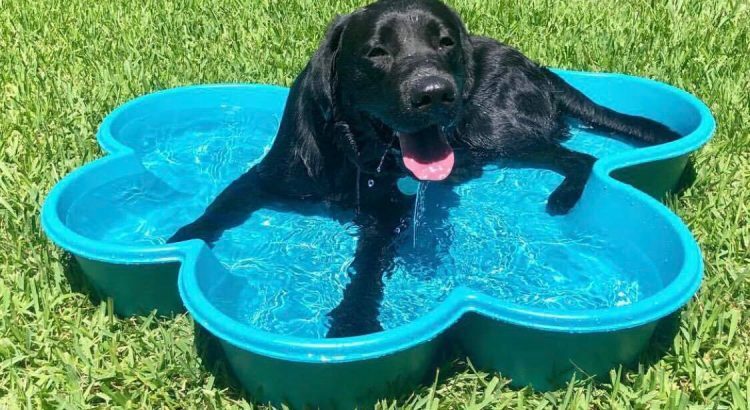 If you are just looking to buy a pool for your dog to cool off then buy one that would be suitable for your dog to sit and maybe lay down. There are accessories that can be purchased along with these dog pools. These can come in the form of ramps for easy access to the pool, dog life jackets and other accessories that will benefit your dog when using the pool. Putting a new object in your garden can be quite daunting and scary for dogs. Give them time to get used to the pool. Let them sniff and inspect it. Encourage your dog to approach the pool by maybe giving them a treat when the go neat or put their favourite toy near it or put it inside. Over a period of time your dog will get used to it and recognise it as something positive. During the really hot summer days, your dog can really struggle to cool down. However, investing into a quality dog pool such as the ones recommended within this article can be the solution they are after. For larger dogs, we highly recommend avoid the inflatable type of pools as the likely hood or them piercing it within a few hours is highly likely. All of our recommended dog pools cover inflatable, foldable and rigid types and are great for a range of dog breeds. There are also several options to choose larger dimensions to reflect the size of your dog. Richard and his family own over 5 different breeds of dogs and is an enthusiast when it comes to a dogs diet, training, toys and accessories around the home. You can read more about Top Dog Hub here.